As the Internet has become more and more prevalent, today almost all homes have built a home network via a network switch. 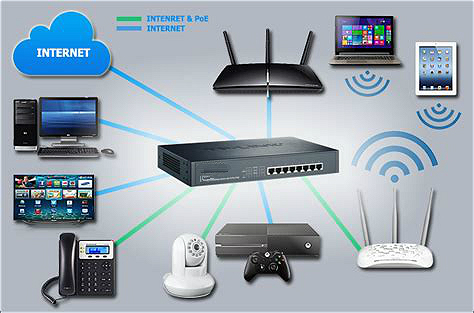 Network switches keep multiple devices like computers, tablets connected, enabling the networked devices to talk to each other and share files like the family photo album, or back up files to a number of devices at once. But do you know how to select the best Gigabit switch for home network since there are so many types of Gigabit switches on the market? Figure 1: A network switch is used for home applications. Implementing a Gigabit switch for home network would ensure your network security. Since a Gigabit Ethernet switch can work at the Data Link Layer of the OSI model, it will recognize what devices are connected to it by learning the device’s MAC address, which aids in keeping data secured by preventing unwanted access. Besides, most network switches support VLAN, so users can set up one VLAN for their houses and one VLAN for the wireless. And users can allow both VLANs to talk to the router but deny the ability to talk to each other. Users could even lock down the wireless VLAN and only allow it to browse the web but nothing else. Thus in these cases, you can use the network switch to manage your network and ensure its safety. Here are some considerations to help you to choose the best Gigabit switch for home network. Considering all the factors, I recommend some 24 port Gigabit switches as follows that are made by FS.COM. FS can provide local support in the USA, UK, Germany, Australia and Singapore. Figure 2: Recommendations for best 24 port Gigabit switch for home use. Choosing the best Gigabit switch for home network allows users to enjoy the smooth gaming and streaming. If you are looking for a home network switch, FS is ready to offer you a wide range of network switches including 10GbE switch, 40G switch and even 100G switch.